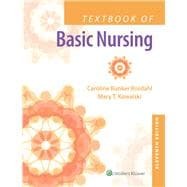 by Rosdahl, Caroline Bunker; Kowalski, Mary T.
Provides students with the knowledge and skills they need to practice nursing safely as LPN/LVNs. Concept Mastery Alerts use data from PrepU quizzing to highlight common misconceptions and difficult-to-understand material. Nursing Alerts ensure that students obtain the critical information they need to safely practice nursing as LPN/LVNs and succeed on the NCLEX-PN. NCLEX Alerts highlight critical NCLEX-relevant content in each key area. In Practice: Nursing Care Plans present a case study using NANDA terminology and the Nursing Process to illustrate how to develop a care plan. Special Considerations highlight key culture, lifespan, homecare, or nutrition information. In Practice: Nursing Procedures present step-by-step instructions with full-color illustrations and rationales. In Practice: Nursing Care Guidelines contain summaries of important concepts, teaching, skills performance, or nursing considerations. In Practice: Educating the Client boxes highlight important teaching concepts. In Practice: Data Gathering in Nursing summarizes the key information needed in gathering data for nursing observations. In Practice: Nursing Process boxes use the steps of the nursing process to guide the LPN/LVN in effective data collection. In Practice: Important Medications boxes summarize common medications used in treating specific conditions, diseases, and disorders.